Buying your first car is an exciting and fun time, but with so much information available, it can get confusing sometimes. You have a lot of options, right down to the method of payment. You can count on our used car dealer in Winston-Salem to provide great advice and feedback when you’re searching for the perfect car, truck, van, or SUV, but here are some things you should keep in mind no matter where you go. You can’t make a move without knowing exactly what you can afford. Work out your budget so you know what you can realistically pay for your vehicle. Though it’d be nice to pay the whole thing in cash when you purchase it, this isn’t always an option, so we encourage shoppers to do the math to set their sights at the appropriate level. It’s easy to get lost in a sea of options when you’re shopping for a new-to-you car. However, never lose focus on how you use your car every day. If you do a lot of towing and hauling, that sparkling sports car is off the table. That being said, if you’re just using it to get to and from work, with the occasional fun ride in one of the area’s many scenic drives…why not? What’s important is that you find a car, truck, van, or SUV that fulfills exactly what you need it to. Once you’ve picked out a few cars to consider, come take a look on our lot. During your visit, ask plenty of questions, leaving no stone unturned. Our non-commissioned automotive solutions providers will have the answers, and more importantly, you’ll have a clearer picture of how your specified vehicles will assist you, and which ones you can afford to drop from the running. If you see a car you’re not quite sure you need, but you just can’t shake—well, that’s when a shopping buddy comes in. Sometimes it also pays to have another set of eyes during the test drive, which is an absolutely crucial part of buying a car. Though we rigorously inspect every vehicle on our lot to ensure it meets our standards, if there’s something lacking and you don’t pick up on it, your partner in crime can be counted on to notice it. Once you’ve narrowed down your options and picked out the perfect choice, paying for it is the next step. Our Credit Miracle Workers will be happy to help you figure out which payment plans work for you, and we’ll work with your budget to help you determine the best ways to pay for your dream car. After all, we believe that everyone has the right to ride! Click to learn more about the Everybody Rides Program. Whether you’re new to car shopping or a seasoned car shopping veteran, we’d love to assist you! 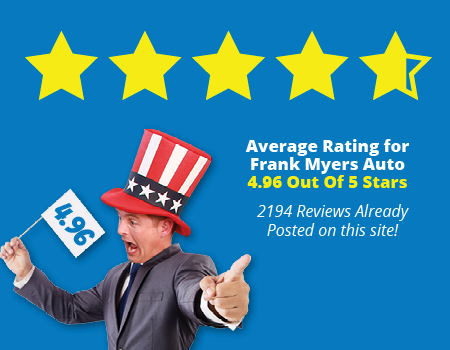 Visit Frank Myers Auto Maxxtoday for competitive prices on high-quality vehicles and an accommodating sales team.